Pouring out ideas on hard paper with hand-drawn sketches have been the architecture community’s trend in the early postmodern era; being at its highest in the 70s and 80s. Although it got worn out of being fashionable as computer-aided design and drafting tools came along, they have not left the arena for good. A notable portion of architecture firms use sketches for design to present their concepts, ideas they build on them, and built environments they imagine and portray through those. Some argue that hand-drawn lines possess a sense of feeling that computer-generated lines lack. Hand-drawn curves and colorings are not sheer lines and brushes, they say; rather they bear something more. They convey the feel of the place the architect means to create in the space she’s designing. Over the decades, technological advances have kept up, so there is another approach to sketch design beside the old-fashioned hand-drawn way. Numerous applications have developed ways to replicate the aforementioned feeling into their computer-generated drawings. OutsourcePlan’s sketch design team supplies their customers with both methods. We use sketch design for different presentation outputs like perspective visualizations and 2D plan, section, and elevation documentations of your proposed architectural design; all of which can be drafted in both monochromic or polychromatic forms. Our customers include architecture firms at full scale and student projects on a lesser tone and both require sketch presentations of their design’s early-developed stages. Both CAD or scanned hand-drawn sketch drawings can be used for initial study diagrams, site analysis, climatic studies, and early drafts and representations of the project for the client’s primary approval. Going forward, we say how we go about doing Architectural Graphics Services for our clients, what makes us more appealing among competitors, and what tools we use to produce your 2D plans, sections, and elevations. 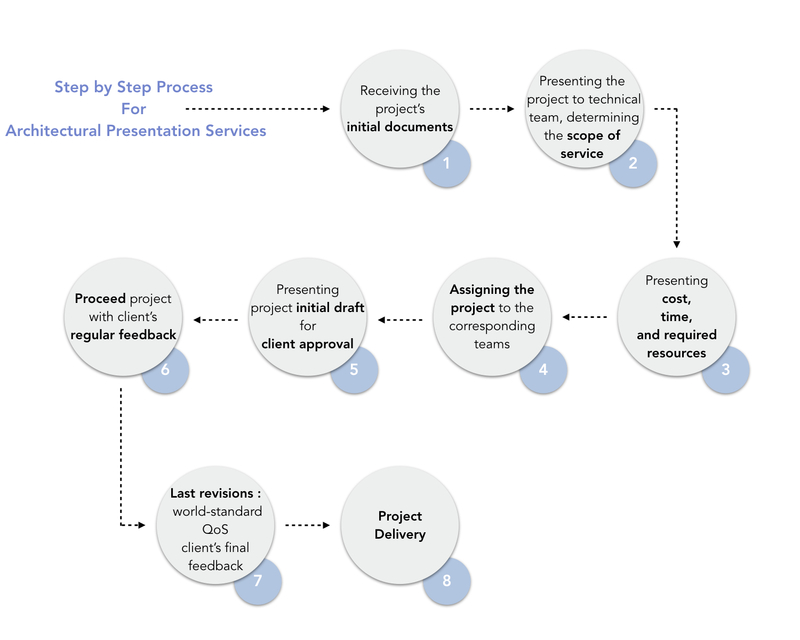 The process our customers go through from the moment they contact our team to when they are delivered the final Architectural Sketch Design Services, includes 8 steps. You should know that the client’s constant supervision drives implementation decisions through all these steps. Our professional, collaborative teams of architects, graphic designers, and technicians will be available 24/7 to make sure you’re provided with the best sketch design services like perspective visualizations, 2D plan, section, and elevation documentations of the of the proposed architectural design. All of which can be drafted in both monochromic or polychromatic. Is a powerful, widely-used tool for creating 2D construction documents. It is one of the most common means to create design sketches. With Revit’s resourceful detailed construction elements you can easily erect an adjustable building up to all construction standards right from the beginning. It also helps you model, render and edit an architecture in a comprehensive environment. Modeling a building in revit is more than merely modeling it’s volumes; rather it models the whole construction process. 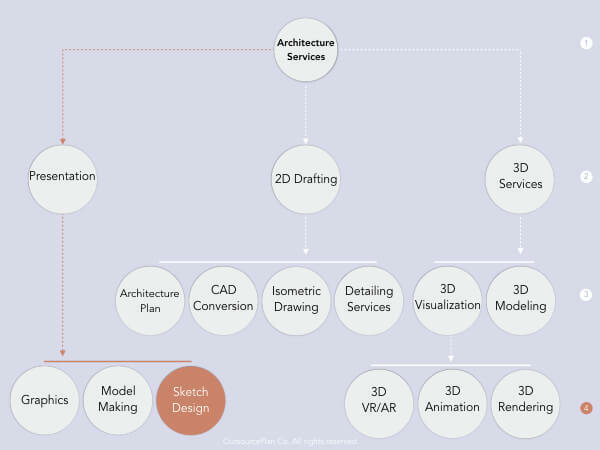 Revit’s modeling paradigm is mostly geared on BIM (Building Information Modeling) framework. It greatly helps with sketch design services. Is one the most prominent tools for 3D modeling and rendering developed by AutoDesk. It helps us produce real renderings and visualizations for sketch design services. Is a BIM-oriented software that greatly helps with modeling a building down to all hidden structural layers. all of which can be used for a deeper, more complete Sketch Design Services.